In 2012, my wife and I went to Morocco. 1 week soaking in the African rays at a beautiful resort in the Atlas Mountains. We got massages, learned how to cook Tagine, and trekked through the mountains. That was an amazing vacation. That was also the last time we went on a vacation that didn’t have anything to do with applying to b-school. I knew coming out of undergrad at the IU Kelley School of Business that I was interested in a full-time MBA, but I didn’t get serious until 2013. My wife and I planned an east coast road trip for April. My wife would see a few new states and I would make it back for some much needed Maine lobster and New York Pizza; but most importantly, we would visit 7 potential business schools, learn what we wanted in a business school and move one step closer to making my Ivy-League aspirations a reality. Our first stop was Philadelphia, maybe the most under-rated city in America (my opinion, of course). After grabbing some cliché photos of us running up the steps of the art museum and pretending we were Rocky, we headed to Wharton. First impressions were mixed. Wharton sits on a nice campus that is very walkable and easy to navigate, but UPenn is an island. The area surrounding the school does not share its appeal and is down-right scary in spots. Class visit, tour, and info session all went well. I couldn’t help but to notice that despite having what I thought to be a very engaging guest speaker many students were checked-out during class. Several students were even working on other things on their laptops! $200K investment in an education and you are checking your emails? Our tour guide, when asked, said that she had applied to LBS, HBS, and Wharton. 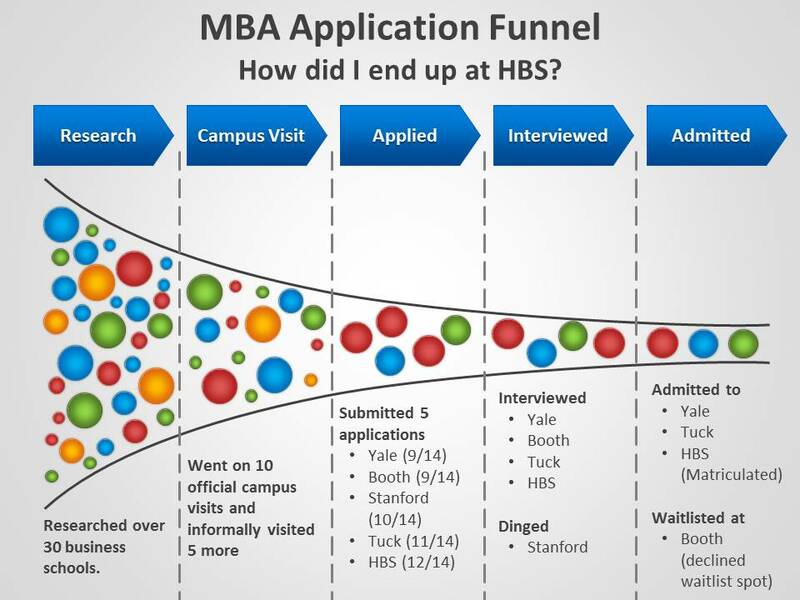 After being let down from HBS, she had chosen Wharton over LBS. She spoke of her rejection from HBS in a disappointed tone. Could this mean she had really wanted to go to HBS? (This was a similar feeling I got from a current student at a later visit to Kellogg.) After going to a large undergraduate business school, I was very much looking for an adult environment for my MBA. Wharton has graduate and undergraduate students right on top of one-another. Overall, I could definitely see myself at Wharton and in Philadelphia, but I wouldn’t call it fireworks. Time to head to one of my favorite places: New York, New York. Columbia is a beautiful urban campus, too bad the business school is the exception. Uris Hall looks like nothing has been updated since the 60s or, even worse, the 70s. Not only is it ugly, but the lack of natural light or reasonable accommodations leads to a culture where people leave after classes and meetings. This coupled with the New York location means that no one lives on or even near campus and Columbia GSB is essentially an Ivy-League commuter school. New York I love you, but this isn’t going to work out. Off to New Haven, CT to visit the school that is in-between Harvard and Columbia. When I picture and Ivy-league campus, I now picture Yale. I was blown away by the Gothic Architecture and ornate fixtures. And what is that amazing glass building under-construction? “Future home of the Yale School of Management” (now current home), that is what I am talking about! New Haven leaves a little to be desired, but overall Yale offers so much through its world-class facilities and art and music departments that there is no doubt it would be a great place to spend two years. The people we met at SOM were fantastic and went out of their way to make my pregnant wife comfortable. After meeting the students and learning about and witnessing SOM’s innovative integrated curriculum, this is no longer a short stop between New York and Boston, this is exactly what I am looking for! Off to Boston and to HBS and MIT. Cambridge, a city I hadn’t spent much time in, is very nice. It is what I would consider an urban suburb, quaint like a college town but crowded and lively like a city. Overall, I find Boston to be a better city to visit than live in (let’s hope I am wrong about that!). Unfortunately, our time in Boston was impaired by the man-hunt after the Boston Marathon bombing. This prevented any serious visits to Sloan. I was only mildly disappointed, since I was afraid Sloan was too focused on Finance and Entrepreneurship and lacked the general management focus I was looking for. Harvard visit was good. The classroom experience and the case method must be witnessed in person. My class was Finance a.k.a. “Fin 2” (a course that I assumed would be a terrible fit for the case method). I was blown away by how engaging and exciting the case method was even for a technical subject like Finance. HBS’s campus is across the Charles River from Cambridge and the rest of the university, so it offers the grown up feel and residential learning environment that were missing from Wharton. After a coffee and a long chat with a colleague studying at HBS, it was time to head to New Hampshire. The remoteness of Tuck didn’t scare me. As an avid outdoorsman and mountain-lover, the prospect of living on the Appalachian Trail and 55 minutes from Killington was exciting. Plus a career in business nearly guarantees a lifetime spent in or around cities, when is the next chance I would have to live in a place like Hanover, NH? No trip to Hanover is complete without breakfast a Lou’s, so we started the morning with French toast. Tuck’s building feels very “Ivy”. I was half-expecting to see a 60s-something professor in a tweed jacket with elbow patches puffing a pipe next to a fireplace. People at Tuck are also great and admissions goes out of their way to ensure you have a great visit. They know and appreciate that you went out of your way to go to Hanover (and rumor has it that they take notice when you are applying too). Although the classroom seemed a bit large for such a small school, I really enjoyed the Operations course I sat in on. I could definitely see why Tuck has such a strong reputation for quality teaching. The on-campus dormitories are beautiful and convenient. However, folks with families are left to seek housing at Sachem Village, a retro-fitted military housing complex a couple miles out of town. Although proximity to other families is certainly a plus, I worried about missing out on events and relationship-building with single classmates. 11 days and 1300 miles before leaving Hanover for Cornell certainly contributed to our tired state and possibly our opinion of Johnson. Cornell feels as remote as Tuck, but doesn’t (in my opinion) offer the same quality of outdoor recreation and small town feel. After sitting in on a course with students and a professor I considered to be slightly less impressive than what I had seen elsewhere, I was told I had witnessed “one of the best courses at Johnson.” I guess that pretty much sealed the deal, Cornell was off the list. 2,300 miles and almost two weeks later we were back in Indy. 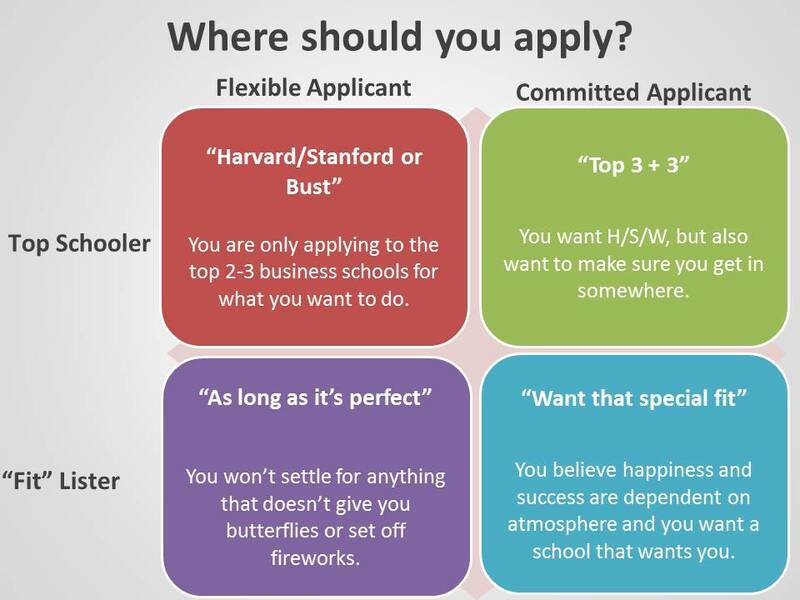 We had scratched two schools from the list (Cornell and Columbia), found three schools that we loved (Harvard, Yale, and Dartmouth), and one school that then seemed like either the best-fit school that I wouldn’t apply to or the worst-fit school that I would apply to (Wharton) (too early to tell). Overall a very informative, but exhausting trip and I wasn’t even pregnant!